There aren’t many that intrinsicly know how much they can tow behind their truck without referring to their owner’s manual. 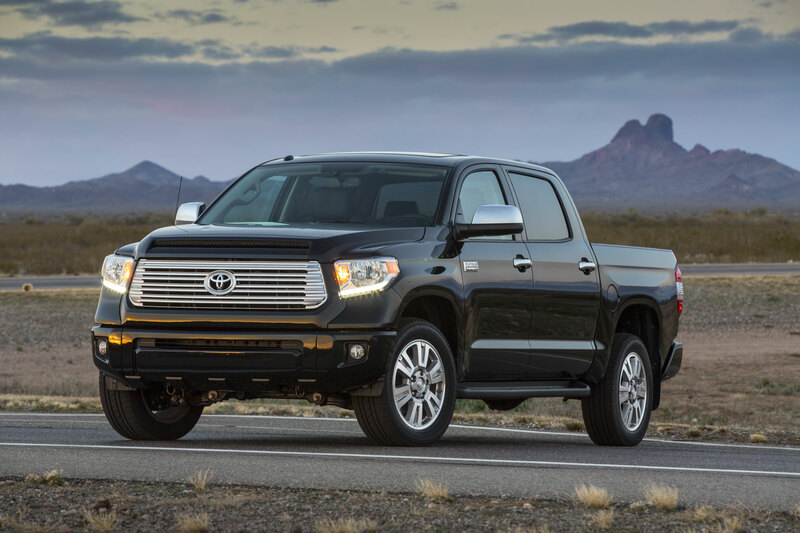 Toyota, however, is the only automaker to adopt the Society of Automotive Engineers (SAE) towing standard, known as J2807, for its trucks and SUVs, beginning with the 2014 Toyota Tundra as the only full-sized truck to adopt the standard. Toyota has been in compliance with J2807 since 2011. The J2807 standard establishes a single, repeatable test curriculum to determine real-world tow ratings for body-on-frame vehicles. Prior to the standard, manufacturers had devised their own tests and published their ratings without a third-party guideline. Toyota has certifications for its entire towing-equipped lineup, including every Toyota pick-up truck, SUV, and minivan. SAE’s J2807 certification includes a comprehensive test of the vehicle’s engine, transmission, cooling system, axles and structural rigidity to handle a rated load so customers will know that rated Toyota vehicles have survived the industry’s harshest test methods. The Toyota Tundra is assembled exclusively in San Antonio and is the only half-ton full-size pickup to hail from the state of Texas. Toyota Motor Manufacturing Texas (TMMTX) employs 2,900 Texans, with on-site suppliers providing an additional 2,800 American jobs. 2014 Chevy Silverado in High Country trim. In one of the closest finishes reported, Chevy’s Silverado earned three more points than the Ram 1500 to earn Consumer Reports “Top Truck” title and an “Excellent” road-test score as well. A small consolation for Dodge will be CR’s testers deemed the 1500 a better daily driver. Both outscored the previously-tested Ford’s F150 XLT, which 3.5-liter EcoBoost turbo V-6 and 5.0-liter V-8 versions ranked third and fourth respectively. best-in-class EPA, 16 mpg overall (+1 mpg over Ram). “The reality is that you can’t go wrong with either one. Both are capable trucks that get decent gas mileage and are as quiet inside as a good luxury car,” said Jake Fisher, director of automotive testing for Consumer Reports. Consumer Reports opted to test the Silverado’s widely sold 355-hp, 5.3-liter V-8 4WD version that had great acceleration but not the thrust of the Ram or Toyota Tundra. For daily use, CR found the Ram a comfy place to spend time with better front seats and friendlier layout and the ride is supported by its rear coil suspension. Consumer Reports tested the Ram with Chrysler’s 5.7-liter Hemi V8, four-wheel-drive, and a new eight-speed automatic transmission that’s smooth and efficient. Consumer Reports found that combination delivered seamless and effortless power, while returning a relatively good 15 mpg overall. Acceleration is quicker than the Silverado and the Hemi feels much brawnier in real-world driving. Complete tests results for the Chevrolet Silverado 1500 and Ram 1500 can be found on www.ConsumerReports.org and in the November issue of Consumer Reports. Ram’s score trumps Toyota Tundra, Ford F-150; Chevy Silverado still being tested; Chevy Avalanche no longer produced after 2013. The hits just keep on coming for the folks at Chrysler/Dodge/Ram these days. For the first time, Consumer Reports named the Dodge Ram as its top fullsized pickup truck. Although this confusing paragraph was buried in the news release, the 2013 Chevy Avalanche actually scored higher than the Dodge Ram, but since it’s not produced after this model year, the win went to Dodge. Although it’s not surprising to automotive market watchers, the fact that the updated Dodge Ram 1500 easily trumped such fullsized pickup names in the Toyota Tundra and Ford F-150 might send shock waves through the unknowing. For 2013, the Ram got a lighter and stiffer frame, a revised interior with a new infotainment system, and updated powertrains. Consumer Reports tested a four-wheel-drive Ram 1500 Crew Cab, with the most popular engine option—the 5.7-liter Hemi V8—mated to a new 8-speed automatic transmission. The combination delivered what CR called seamless power while producing class-leading 15 mpg overall in CR’s fuel economy tests. The complete tests and ratings of the Ram 1500 appear on www.ConsumerReports.org. The Ram 1500 earned a 78-point overall road test score. Other tested full-size pickups include the Toyota Tundra (69) and the iconic Ford F-150 (68). CR is studying the 2014 Chevrolet Silverado and will announce its findings later this summer. Ford’s F-150 will be redesigned for 2015. Prior versions of the Ram have been reliable so Consumer Reports is Recommending the freshened truck. To be Recommended, a vehicle must perform well in CR’s battery of tests, have average or better reliability in CR’s Annual Auto Survey and perform well in government and industry crash tests. CR liked the Ram’s ride-owed to its coil spring rear suspension-a super-quiet, roomy crew cab. It noted the optional UConnect infotainment touch screen is one of the best in the business. A negative, but part of the process of building a large fullsized pickup, CR noted that step into the cab is high and the tailgate is heavy, unsprung and not damped so it drops quickly. This news didn’t really shock me that much. A great deal of Hondas are made in Ohio. Nissans are in Tennesee, BMW’s in Spartanburg, S.C., Chryslers up in Canada, some Fords are farmed out to Mexico and the list goes on in true global manufacturing form. Sure you can go all “baseball, hot dogs, apple pie and Chevrolet” in your American purchase, selecting a vehicle with a bowtie on the grille, or review the research from my friends at Edmunds.com that examines “American content”. Doing just this, Edmunds.com discovered that the “most American” vehicle in 4 of 8 vehicle segments is made by one of the two Japanese brands. 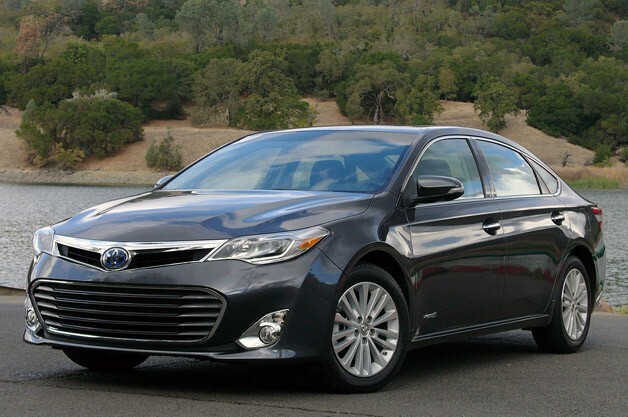 Research found that the Toyota Avalon (80% U.S./Canadian content) was the “most American” car among sedans. 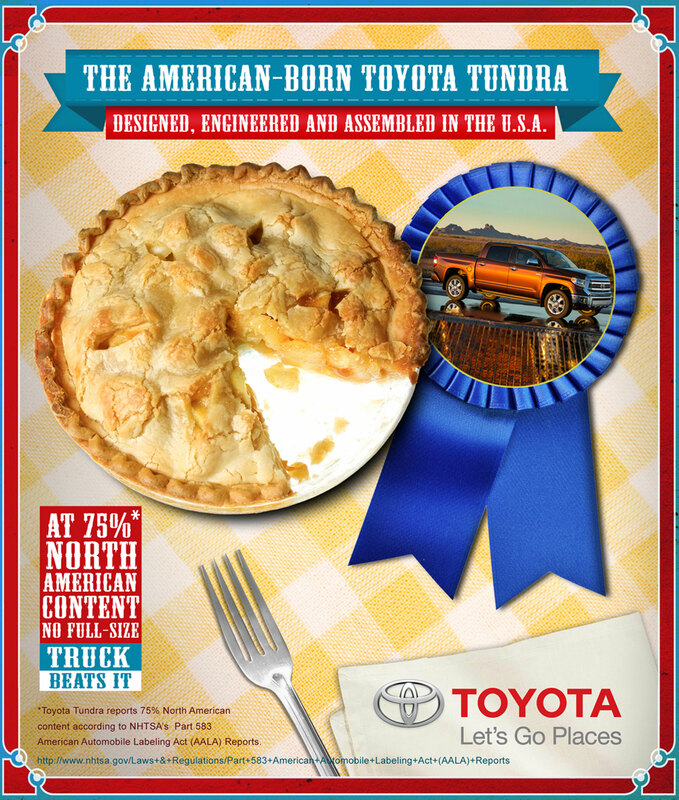 Toyota Tundra (75%) and Toyota Venza (65%) each tied for the “most American” vehicle distinction within the Trucks and Wagons categories, respectively. Meanwhile, Honda Crosstour (75%) is the “most American” car among hatchbacks. * – percentage of U.S./Canadian content based on information reported by carmakers to the National Highway Traffic Safety Administration (NHTSA) under the American Automobile Labeling Act (AALA). Finding a car that’s born and bred in the United States was supposed to be made easier by the American Automobile Labeling Act (AALA), which requires carmakers to provide parts-sourcing and manufacturing information to car buyers. But the AALA list (which Edmunds.com used for its analysis) can be puzzling. Under its provisions, for example, the term “American” means either U.S. or Canadian content. The percentage of U.S./Canadian parts content for the car line. The names of any countries other than the U.S. and Canada that individually contribute 15 percent or more of the equipment content, and the percentage of content for each such country, to a maximum of two countries. The final assembly point by city, state (where appropriate) and country. The country of origin of the engine. The country of origin of the transmission. A statement that explains that parts content does not include final assembly (except the engine and transmission), distribution or other non-parts costs. Ultimately, says Edmunds.com, car buyers still have to decide if those factors add up to their personal definitions of an “American” car. Edmunds.com has more information on how to evaluate an “American” car at http://www.edmunds.com/car-buying/how-to-buy-an-american-car.html. When a car buyer purchases an “American” car from a foreign automaker, does that money stay in the U.S. or does it go back to the carmaker’s home country? Edmunds.com attempts to answer this question at http://www.edmunds.com/car-buying/foreign-cars-made-in-america-where-does-the-money-go.html. It was not an April Fool’s Day Joke – Toyota announced its March 2013 sales results of 205,342 units, an increase of 4.8 percent on a daily selling rate (DSR) basis. Unadjusted for 27 selling days in March 2013 versus 28 in March 2012, TMS sales were up 1.0 percent over the year for the same month. Toyota Division posted March total sales of 182,152 units, up 3.1 percent year-over-year on a DSR basis. Volume-wise, Toyota Division sales decreased 0.5 percent over March 2012. Lexus reported March total sales of 23,190 units, up 19.4 percent on a DSR basis and up 15.1 percent by raw volume compared to the same period last year. The awards highlight the vehicles that provide the best combination of quality, features and space that today’s families need. In an effort to help families find real vehicles that provide value for them, US News Best Carswebsite, published by U.S. News & World Report, created its ‘Best Cars for Families’ award, listing vehicle winners in 19 categories. More than 27 million people researched vehicles on the website in 2012. The Best Cars for Families awards combine quality, size and family-friendly features into a composite score. Within each of the 19 categories, the vehicle with the highest score is named the Best Car for Families in that category. Quality is measured using a weighted average of scores from the U.S. News rankings at the time the awards are published. The rankings compare cars on the basis of safety, reliability and a consensus of automotive critics’ opinions. Size is based on a vehicle’s seating capacityand interior space. For family-friendly features, we factor in the availability of features deemed to behelpful to families by U.S. News editors. General Motors won the most awards with six of its models across three of its brands as winners: Chevrolet Suburban, Chevrolet Traverse, Chevrolet Cruze, Buick Verano, Buick Lacrosse and Cadillac Escalade. The award winners are mixed between foreign and domestic automakers. Import brands took home nine awards while domestic brands took home 10. This year is the first year that Chevrolet, Jeep, Mercedes-Benz, Audi and Lincoln have won Best Car for Families Awards. Perhaps not surprising to auto aficionados, the Honda CR-V, Honda Odyssey, Lexus RX-350 and Toyota Highlander Hybrid have won Best Car awards three years in a row. 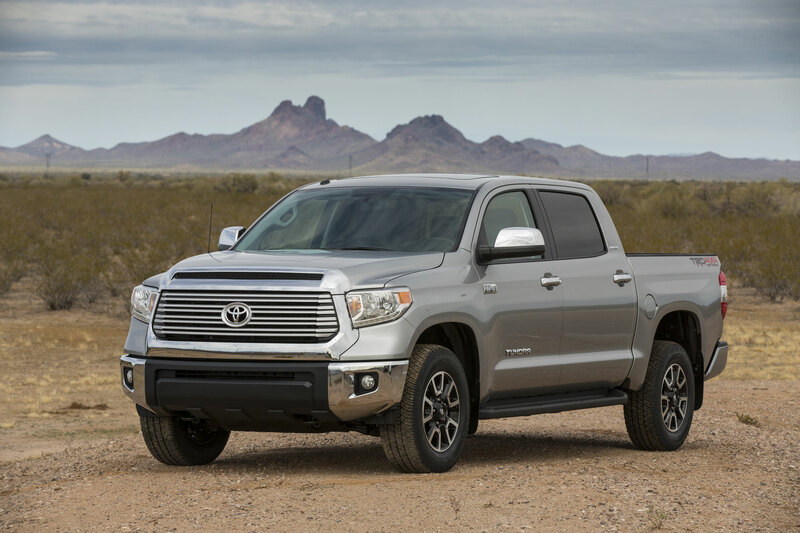 Toyota rolled out its 2014 version of it vaunted Tundra pickup that was totally redesigned, showing its first major overhaul since its debut for the 2007 model year and will be assembled exclusive at the marque’s San Antonio, Texas plant. The new 1794 Edition is a tribute to the ranch, founded in the year 1794, on which the Tundra plant is located in San Antonio. four-door CrewMax, all available in 4×2 and 4×4. – A 4.0-liter, 270 hp, (278. lb-ft. peak torque) Dual Overhead Cam (DOHC) V6 is standard on Tundra Regular and Double Cabs and paired with a 5-speed automatic transmission with uphill/downhill shift logic. Both V-8’s come standard with a 6-speed electronically controlled automatic transmission. All Tundra engines feature an aluminum cylinder block and DOHC heads, along with Dual Variable Valve Timing with intelligence (VVT-i) for a broad torque curve and optimized efficiency. The interior is roomier – hard to believe in a way – and the use of all the major controls with a gloved hand as demonstrated when it first debuted – carries through out – making it a snap for anyone wearing snow gloves or work gloves … an idea some other large pickup truck makers ought to examine and re-think in their center console stack design. The all-new front design integrates the hood and grille for a chiseled and modern industrial image. The chrome grille has a taller, bolder look visually connecting the upper intake to the lower bumper. The front lower bumpers are now a 3-piece design, allowing for grade differentiation and less expensive replacement parts. The 1794 Edition reflects a western lifestyle theme and includes exclusive premium saddle brown leather seating with embossed leather and ultra-suede accents and added content such as heated and ventilated front seats, JBL audio and Entune, navigation and Blind Spot Monitor with Rear Cross Traffic Alert. 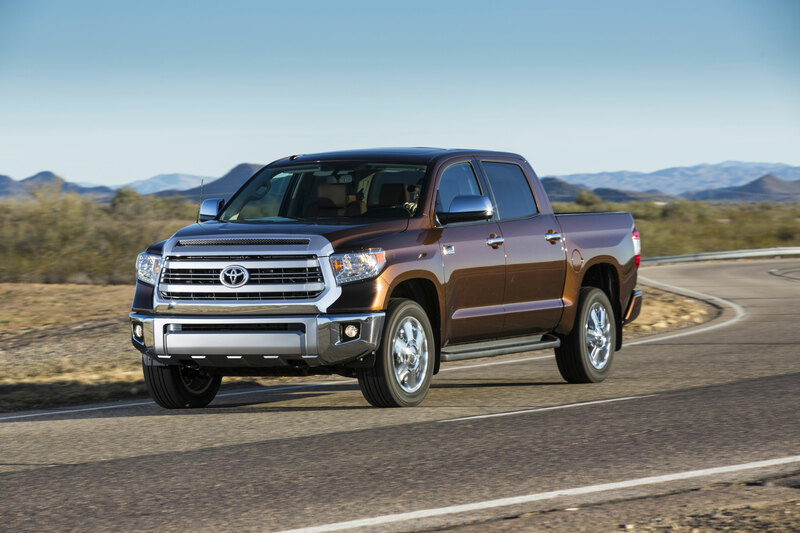 Handling Enhancements Several enhancements have been implemented on the 2014 Tundra to improve performance. Shock-absorber valving has been re-tuned to improve Tundra ride quality over harsh surfaces. Tundra remains the only full-size pickup in the segment to adhere to the SAE J2807 towing standard. When equipped with a tow package, Tundra has a maximum tow capacity of 10,400 pounds (4×2 Regular Cab). Information used in this report was received from Toyota.